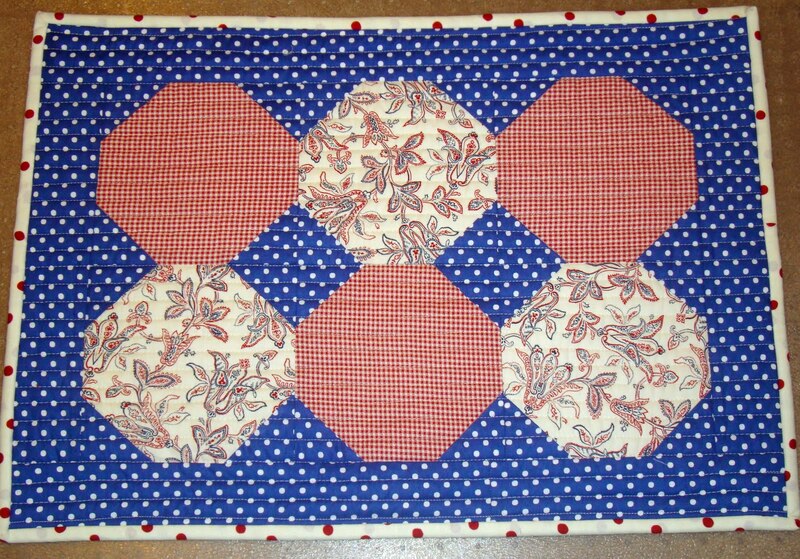 Sarah is our organizer, hostess and designer of the place mat pattern shown above. 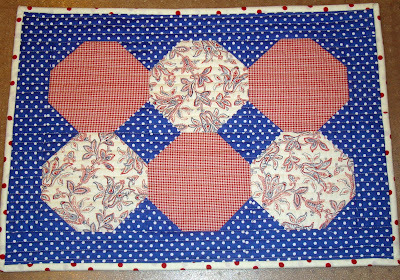 She is having a blog hop party this week and asked me to participate today by making her new pattern into 4 place mats and show them on my blog. I was happy to be able to play along with the other girls and show you Sarah's new pattern. Sarah is revealing this pattern during the week and it is available for sale at her blog. There are giveaways everyday and a grand prize giveaway on Sarah's blog at the end of the week. 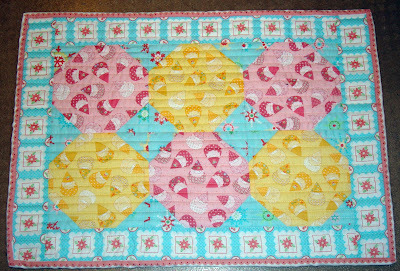 Please Blog Hop on over to Sarah's blog for all the details in case I don't have something exactly right. Disclaimer: Sarah sent me her pattern to make a set of place mats for this party. However, I don't use place mats at my house. I'd have to make way too many! But I do use the place mat concept to make table accessories for my house. I hope Sarah forgives me for not following the exact rules of the game. And I hope you can see many possibilities from what I make and from the other ideas linked to Sarah's party. First I made Sarah's pattern into a valentine place mat. Yeah mine look different from hers, and probably everyone else. Again, forgive me Sarah. I often purchase a pattern, and make it my own in some way. I know lots of quilters do that so maybe you'll understand. I realize that the Valentine place mat looks really busy. But if you look at it for a while you can see the resemblance to her pattern. Next I made Halloween Houses into a place mat. The fabric is whimsical and I used non-Halloween fabrics as complimentary pieces. It is easier to make out Sarah's pattern here. This one is for Memorial Day, 4th of July, Labor Day, all the summery patriotic holidays. Again I used just regular fabrics together to create a flagish color scheme. And this time I pretty much did follow Sarah's pattern. My last (and favorite) is a very non-traditional color scheme for a Christmas place mat. I love love love Monica's new Holiday Happy fabric. She has it in 2 color ways. But this set of colors matches all my other Lecien. And really, I can get away with using this other times than Christmas. I'll just pretend those designs are not Christmasy when I want to. I really love this place mat. So I wanted to show a representation of how I might use the place mats for holiday decoration in my home. Valentine means red. The beautiful teapot was a gift from Lori Holt. I am so glad red is in most of our holiday themes. I don't like a huge show of holiday decoration at my house. I think a little goes a long way. 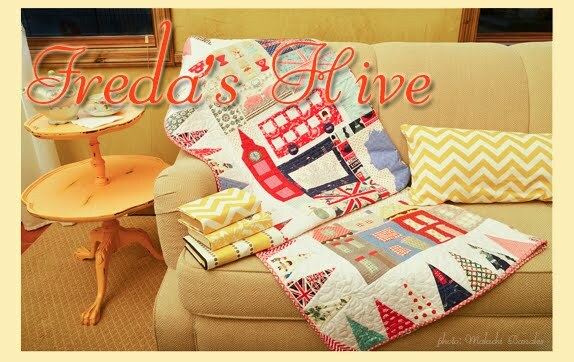 So I like to use quilts in different sizes to bring that hint of whatever holiday spirit into my house along with a few accessories. I could have candy in either of these little kitchen items. Flora gave me these patriotic accessories that I display on my entryway buffet. I think they look lovely partnered with my new place mat. To me, pink, yellow and aqua say fun. And Christmas is fun. So these colors work for me. I might put the seasonal or holiday place mats on my table or in my sewing room with anything on top of them. This is the kit you will receive. Well not with Monica's Happy Holiday fabric underneath the kit. But hey her fabric would make a cute bag wouldn't it! hmmm Thinking. Leave a comment after this post for a chance to win the kit. Say anything. Well anything nice. If you comment on a different post here you won't be included in the giveaway. Just comments on this post will be considered. You also want to go to Sarah's blog to comment in order to win the grand prize. And don't forget to visit everyone and see their place mats and their blog prizes you could win. Refer to rules and details on Sarah's blog. I'm kind of running a few different directions right now. So I hope this all makes sense! And it is nearly midnight. My computer is back and running great. Thank Heaven! So I had to push making this post to the very limit. Enjoy and leave a cute comment!! I love what you did with Sarah's pattern. So much inspiration...thanks!!! Amazing! Beautiful! Fantastic! Thanks so much, Nanette. This is exactly how I love to use patterns too. 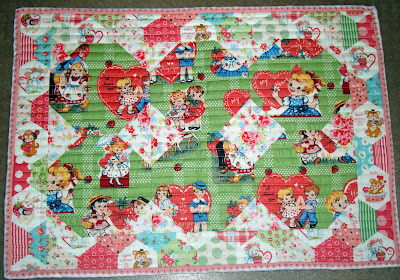 I love your valentine placemat!You have done a wonderful job to inspire lots of placemat fun. Thank you so much!! Love your spin on the pattern! I too use few place mats but love me some runners!!! Oooh how exciting, I love that bag, and the fabrics you have chosen look gorgeous (even without Happy Holiday LOL!). 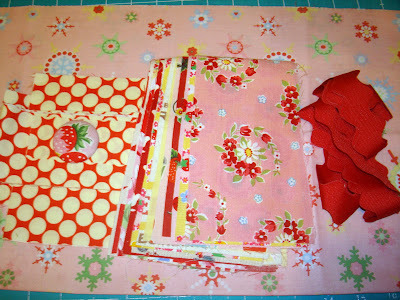 I love the fabrics you used on the placemats too, just gorgeous!! My mind is all abuzz, cute placemats. I made some for my daughter for christmas last year but I love the wimsy of yours. I have a one year old grandson.....I feel some fabric fun coming on! Thanks for the post. You did a very nice job, Nanette. I can't decide which one I like best! I use placemats in the center of my kitchen table, usually holiday/seasonal themed, too. Glad your computer is back up and running! 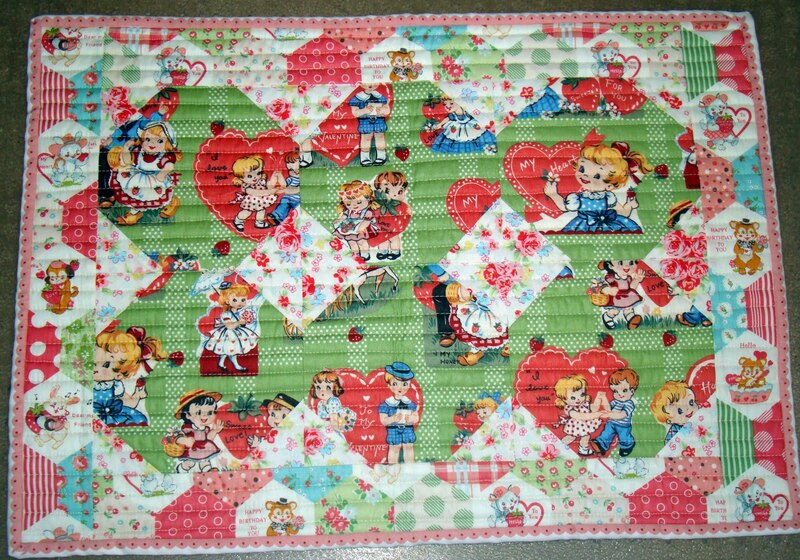 Oh, Nanette, the valentine's placemat stole my heart! :) Lovely color combos as usual. PS..I would love to win a kit! :) Thanks! Your placemats are great and I would love to win a kit! I love the Halloween print in that placemat - following you for a while from Pots and Pins. You have great pictures of your fabrics. I like the valentine placemat the best...but you they all look good. You always do such nice work. I didn't like snow-ball panel(?) before. I've seen a lot of quilts with it and these placemats are so beautifuls. Perhaps I will make one day something with snowball. Wow, I was expecting to see ... a placemat. You've given me several to ponder! You did a terrific job on them and have most of your year covered for decorations! Thanks for sharing them. I just found you through the Stash Manicure and immediately added you to my blog list. It's amazing, so many different looks from the same pattern. All wonderful and fun. And lucky you, to have some of Monica's Happy Holiday fabric to play with. I'd love to win the kit to make that gorgeous bag. Now I need sometime to read the rest of your posts. I would have to make too many placemats at my house too, but I love the way you use them for decorating. You did a great job with the pattern. My favorite would be the Halloween one. I love your bag! I hope I'm lucky this year. Luck seems to revolve around every 4 years for me and I don't know what year I'm on. Great placemats. I love the Halloween one the best. 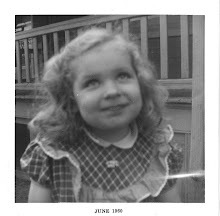 Nanette, I found your blog about a month ago and check it every few days. I love reading your posts and the color choices you make. The purse kit for Panguitch is divine. Your fabric choices for the placemats are extremely creative! I'm VERY! excited for the chance to win a bag kit! yeah! Thanks Nanette. Love the Halloween Houses placemat! Hi Nanette! I would love to win the purse kit! The colors are such fun - I can't wait to have it on my arm - so wish me luck! Also, loved the placemat pattern - I too loved the Halloween mat! Thanks for being such a generous lady! I do use placemats but love your decorating idea as well, rather than a table runner, for your pretty seasonal items to sit on. The polka dot teapot is adorable! Red is my second favorite color next to green :) I'm looking forward to getting some of Monica's Santa Gnome fabric, hopefully next month at the big quilt show. your placemats look awesome! I love the halloween one and the valentines one and the patriotic one...okay all of them! : ) I would so love to win your bag kit...those fabrics are awesome too...and plenty of red...my fav!! I love the Halloween placemat the most! Your choices of fabrics to compliment the Halloween theme is very nice. Ireally like all the placemats and your blog.Thanks for having a giveaway. Great job on the placemats, I especially love the Halloween one and the pink/yellow/blue one! The placemats are very cute. Love the holiday themes you choose. Would love to win your bag kit. They all turned out so cut at Panguitch. Darling placemats in so many different themes! 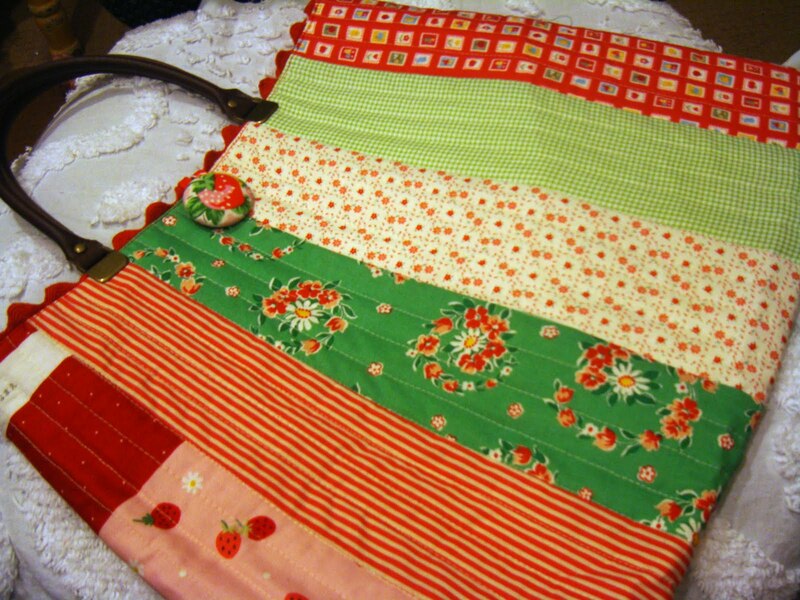 Love that bag too and how fun it would be to make it with your fabulous kit! What a fun give away. You did a great job on those placemats. I love how you made your placemats for the holidays. They will be fun accents around your house. 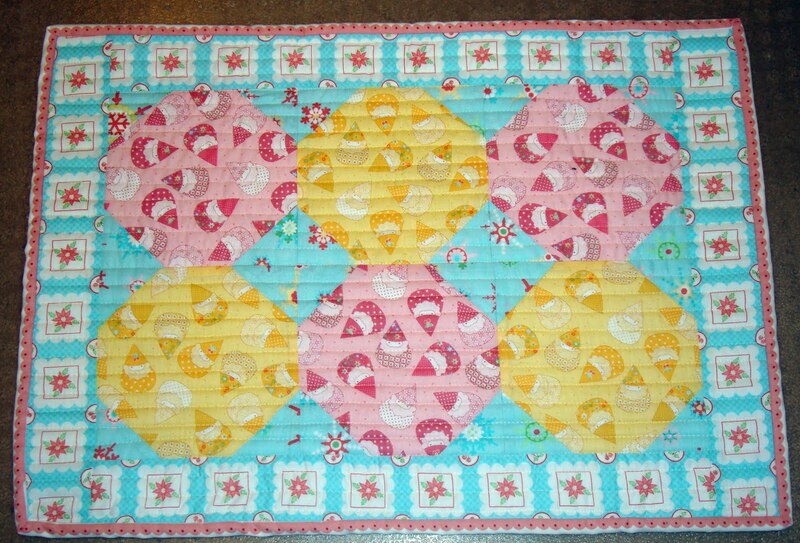 It is fun to see one pattern done in lots of different fabric combos. They are all so cute, but the Valentine's one is my favorite. I am a little too excited about your Mixed Bag kit giveaway. I have wanted to make one for so long. I hope I'm lucky!! wow! i love all of your fabrics and patterns. they are just so dawgone cute! crossing my fingers for the big giveaway -- how exciting is this!! I am dying to try out that mixed bag pattern! I would love to win. I love your placemats. From all those different placemats, I couldn't say which one is prettiest. I love to see Monica's fabrics in one. It is on my wish list. So happy and bright! The giveaway: what a beauty! Darling placemats and I love your teapots adorning the tops of them. Thanks for telling us about Sarah's blog. Very fun placemats and love how you have them decorated. Oh my gosh...how cute is that combination of fabrics! I LOVE these fabrics and I've never made a bag, so this would make a great first! I like the holiday mat idea. Kind of reminds me of my mom using dresser scarfs on our dressers when we were kids. Nan...I love the way that you used Sarahs pattern. I don't use placemats as there are too many of us too But I do love table runners ans these are perfect. I love the valentine's one, it's so colorful and fun. It would be fun to have slightly different ones like that on the table and have the kids do a "seek and find" while they wait for dinner to finish. I love all the variations of the placement. I just have to tell you that I love your blog! You make my day when I read your blog! I like all your different themes! I especially like your halloween version! Thanks for the chance at your giveaway. Thanks for the HUG yesterday and I'm so happy I ran into you before you headed back to work. Kenna had her last ball game last night and the game went until 830pm and then Kenna was hungry so by the time I got home it was really late. So sad I missed quilt group last night. I love your bag and need to make one. I bought the pattern some time ago and just need to get to it. Soon I hope. So very cute and the placemats are darling. Love it!!! Great placemats, Nanette! The Valentine one is definitely you! What a great giveaway...love the fabrics. Nice placemat pattern, looks like it will sew up pretty fast. I like how made this pattern look different by your fabric choices! 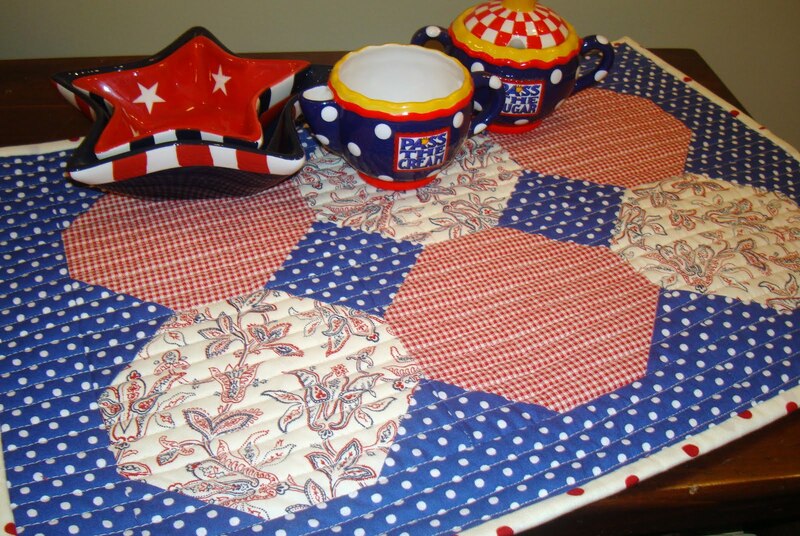 Look at all the fabulous ways you put that placemat together!! I just love the valentine one, it's simply gawjus!! Would love to be the winner of your bag kit. It is so cute. Besides I love your blog. Your always have fun things to say. i love the placemats you made. i want to use the same black and yellow color scheme too. thanks for hosting the giveaway. Love the way you made the placemat pattern yours. They all look lovely but so different! The bag with its scrappy look is perfect for carrying the summer reading book (with snacks)to the beach. Thank you for sharing. Your placemats are so cute. I love the valentine one. Thanks also for the give away chance. Great work! Colorful & happy fabric combinations. I love what you did with Sarah's pattern, congrats!!!! 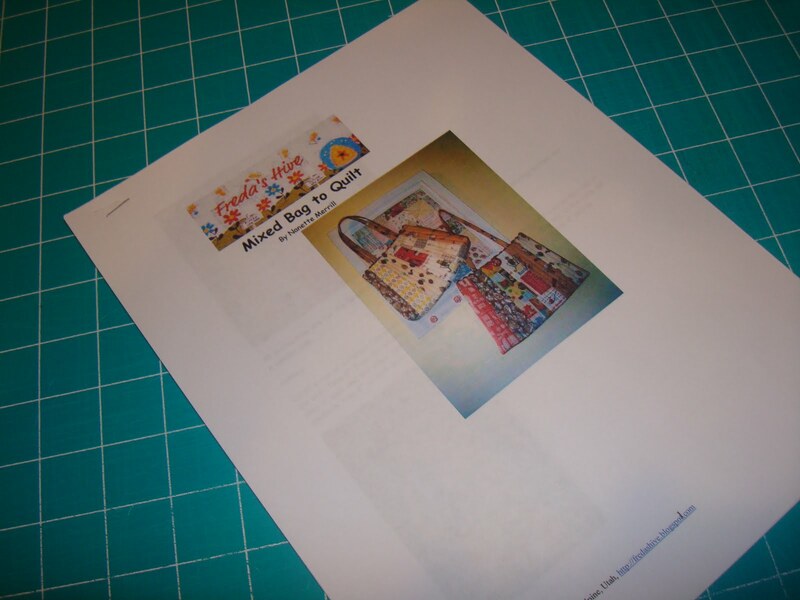 You really showed what a difference fabric and color choices can make on a project. I especially liked the Holiday Happy placemat. I'm going to have to find those fabrics. 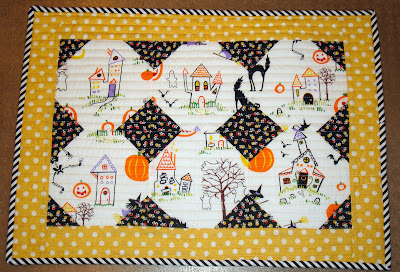 Love all the placemats (especially the halloween one) so interesting to see them in different fabrics. The placemats are lovely - and if you don't use placemats (I don't either!) you can just call them candle mats and use them all around the house! Your placemats are so cute. thanks for hosting the giveaway! What a fabulous choice for a give away!! I love the pattern and you chose the perfect fabrics to make it out of! Super fabric for this bag and fist my perfectly!!!! Just hope, hope hope I am the winner. Love your blog, and read it every day. Thank you. I'm glad I'm not the only one to put little quilted mats in various places besides the kitchen table!!! I also put them on the vanity in the bathroom (off to the side of the sink).....drape them over the backs of chairs in the living room.....have them on the fireplace mantel...anyplace I feel like plopping them!!! It's fun to do that!!! i think i could do that (snowball placemats) The reason they look so tempting is your adorable fabrics. You have "the" best stash. I love all the placemats. There all so happy. Love that RED teapot too. Your bags are adorable. I'd love to win the kit. 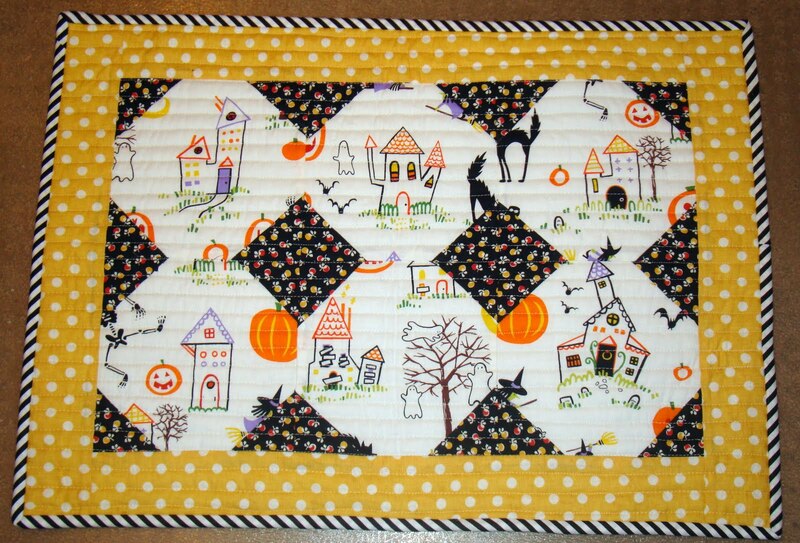 I love the Halloween mat - all of them are sweet though, with your awesome choice of fabrics!! I LOVE your bag pattern and proudly wear it every single day! I bought one of your bag kits too so I'm extra chic! I love to see the same pattern in several different colorways. So many ideas for just one pattern. I am enjoying this placemat party! Love using placemats to mark the season and yours are great!! !Also love your bag, thanks for the chance to win the kit! sweet placemats, I love the valentine one especially. I would absolutely L-O-V-E to win that kit!!! My favorite placemat - the one with the Halloween fabric! The placemat party is so fun. I use them as table centerpieces-or connect and make table runners. Love the fabric and you are very inspirational. Thank you for the chance to win! I love all the different variations of your placemats - this looks like a really fun pattern. Great giveaway - I really enjoy your blog and seeing your creativity. Holy Cow woman -- you're so busy my head is spinning! Cute placemats!!! AND purse! Love the placemats! And the bag is darling! You are always so busy....I love your energy! I'd love to win the placemat pattern because we use placemats every meal all the time. I love the placemats you made. They are so cute! I also love you bag. Thanks for the chance to win. Cute, cute, cute! I use placemats for everything but a placemat...nice variation on the pattern. That bag is adorable, thanks for the opportunity to win. very cute placemats! I too wouldn't use them for placemats for my family as we have 10 kids and then there are the spouses and grandkids! :) Nice way to add a little color and decoration to any holiday! Thanks for the chance to win your bag kit!! I love your placemats! We don't use them at our house either, but not for the same reason, my little ones make such a mess that I'd be washing them CONSTANTLY!